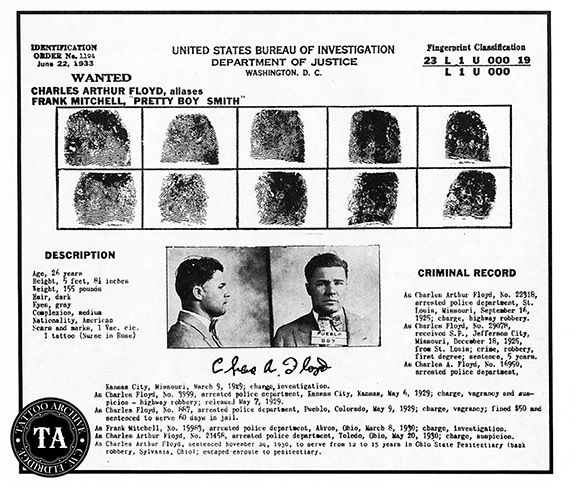 Charles Arthur ("Pretty Boy") Floyd was born in 1904 in Adairsville, Georgia. When we was seven years old, his family moved to Oklahoma where he grew up. 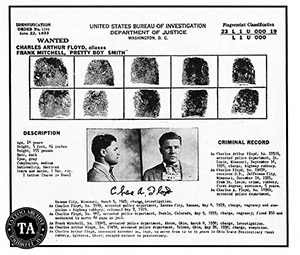 After some minor scraps with the law, Floyd staged a payroll robbery in 1925 and was sentenced to 5 years in prison. He served 3½ years of it, and it’s said that he swore to never see the inside of a prison again. Perhaps from a connection made while in prison, Floyd stepped up his game and started running with more established criminals; robbing banks and killing people in the process. After being described as “a mere boy, a pretty boy with apple cheeks” by a robbery witness, the press started calling him “Pretty Boy Floyd”. It is said that he hated the nickname. In the late 1920s and early 1930s Floyd was on a tear. He was either wanted for or arrested for a variety of crimes including vagrancy, highway robbery, investigation of murder, bank robbery, etc. 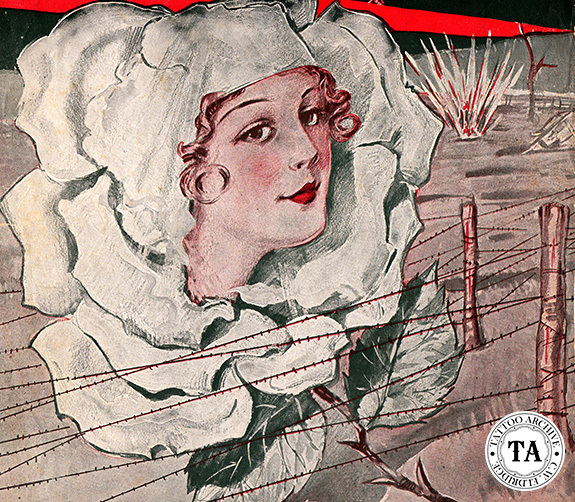 You may be wondering by now, how did "Pretty Boy Floyd" work his way into tattoo history? 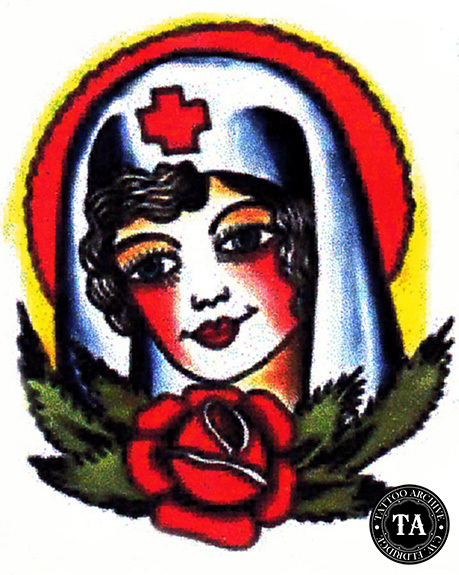 On his wanted poster under the description in the scars and marks section, it lists that Floyd had one tattoo - Nurse in Rose, or as it's known in the tattoo world, the Rose of No Man's Land. The Marshall was tattooed on that visit by Bert with the same design he had seen on Floyd's shoulder. Another interesting sidelight to this story is that at that time Bert's brother-in-law was the Chief of Police in St. Louis and was upset to find out about Bert's contact with Floyd, after the fact. After John Dillinger’s death in 1934, Pretty Boy Floyd's life of crime led him to be listed as Public Enemy #1 by Edgar J. Hoover’s FBI. It was in late 1934 just north of East Liverpool, Ohio, that Floyd’s luck ran out. He was hiding out with friends and riding in their car when he was spotted by lawmen. Floyd broke from the car and ran toward the tree line and was shot down by the police. As with any legend there are several different stories about Floyd’s death, we don’t have the space to go in all of them here but they make for good reading. Today Charles Arthur Floyd remains a familiar figure in American popular culture, sometimes seen as notorious, and at other times viewed as a tragic figure, partly a victim of hard times. He was immortalized in 1939 by the Woody Guthrie's song "The Ballad of Pretty Boy Floyd." The song contains this famous line, "As through this world you travel, you'll meet some funny men. Some will rob you with a six-gun, and some with a fountain pen".